If White River could talk, it would tell of the arrival of a tribe of Native Americans who established small villages along its banks in the late 1700s. Before their coming, the river would tell of the occasional Indians who either spear-fished its waters, crossed over in pursuit of wild game, or were seeking a patch of berries growing the fields and forests that bordered its banks. That was the norm for centuries until late 1795 when a displaced tribe of Indians called the Lenape, or Delaware as the English called them, began to arrive; an arrival brought about by the Treaty of Greenville. No record exists as to when and where the first to arrive established themselves but, by 1798, a Delaware Chief of the tribe's turkey clan called Kikthawenund arrived on the White River and selected a site for his village which was populated by 15 or 16 families. At first they lived in wigwams, which gave way to the more permanent log-constructed houses. He called his village Wapeminskink, a Delaware word meaning "chestnut tree place," so named for the once-numerous chestnut trees that were found in and around the village site. The trappers and traders who made their livelihood in the area called the village Anderson's Town, which evolved into Andersontown over time. The reference to Anderson came from the chief's other name, William Anderson. He was the son of a man of Swedish ancestry named John Anderson and his wife, the daughter of the Delaware Chief Netawatwees. Anderson's Town was one of five villages along White River in what is today Madison County. It was the largest and commanded a majestic presence situated upon a bluff 76 feet above the river in what is today downtown Anderson. Four factors figured into Anderson's choice for the a village site. The first was its strategic location, which provided an unobstructed view necessary to protect the village from the threat of approaching enemies. The second was the availability of water not only from White River but from the numerous springs that flowed continually from the top and slope of the river bluff making their way to the river. The reliable food source was the third factor. The river contained fish and mussels, while the nearby forests contained an abundance of wild game. Along the river and immediately north of the village was an open area used for planting of corn and other vegetables. This open area extended along the river for almost a mile. The first three factors were important consideration in establishing any village site. The fourth factor was a real plus, as it positioned Anderson's Town squarely on the main trading route(Conner Trail) between John Conner's trading post south of Brookville and his brother William's post south of Noblesville. If the river could talk, it would tell of a river crossing at the southeast edge of the village that brought what was known as the Indian Road to Anderson's Town from its origin at Wapekommekoke southeast of present day Muncie. After crossing the river, this road(Wheeler Avenue) intersected with the Conner Trail(Cincinnati Avenue), which then passed through the village and exited to the west(Eighth Street) ending at William Conner's trading post. If the river could talk, it would tell of a long house situated on the bluff near the southeast edge of the village. On at least one occasion, John Conner witnessed dances and ritual ceremonies held there, and described the structure's appearance. It was roughly 40 feet long and 20 feet wide. It also served as a Council House where important discussions took place and decisions were made. It was built of split logs set together between dug-in posts. The roof consisted of tree-bark or clapboards, resting on strong pillars dug into the earth. The entrance was at both gable-ends, and there was neither a floor nor ceiling. Near both ends and in the middle were three fires over which hung large kettles in which corn and meat were boiled. In the roof, there were openings over every fire to allow the smoke to escape. Along the inside were seats or elevations from the ground about a foot high and 5 feet wide. They were first covered with the bark of trees and then with long grass. Conner placed the long house near the southeast entrance to the village, which today is near the site of St. Mary's Catholic Church. The village stretched to the northwest along the top of the river bluff to the burial grounds which were located where Anderson's City Hall is presently located. Nearby was Chief Anderson's house, a double-sided two-story log structure built into the hillside that was to become the southeast corner of the intersection of today's Eighth Street and Central Avenue. A part of the village was located in the flat area between the bluff and the river. If the river could talk, it would tell of a major flood on March 8-9, 1805. When it was over, those who had fled the fast rising waters returned to find 3 to 4 feet of water standing in their houses. If the river could talk, it would tell of a great occasion occurring in the village in May, 1806, when Chief Anderson was named the tribal chief of all the Delaware. It would also tell of the visit by a Shawnee Indian named Tecumseh sometime in 1811. He asked Anderson to commit his Delaware to an Indian Confederation intent on re-taking lost Indian lands. It would also tell of Indian runners arriving in Anderson's Town from the Mississinewa River in December of 1812 requesting warriors be sent to help the Miami defeat the Americans. Because Chief Anderson chose to remain neutral and not take part in either confrontation, the Delaware were rewarded by Indiana Territorial Gov. William Henry Harrison, when he temporarily moved the tribe from the White River to Shawnee towns on the Auglaize River near Piqua, Ohio. The move was the precursor to the arrival of troops dispatched by Harrison to remove the scourge of dissident Indians by burning their villages. As a result, Anderson's Town was burned in the summer of 1813. It was not recorded when they returned but, by 1817, the village had grown to a population of 1,000. In October of 1818, a treaty was concluded at St. Marys, Ohio, by which all the Indians residing in the new State of Indiana were to relinquish all claims to land held by them in exchange for lands west of the Mississippi River and other compensations. If the river could talk, it would tell of the departure on September 20, 1821, when approximately 50 canoes carrying Chief Anderson and those too old to travel by land pushed away from the river's bank, beginning a journey to a new home somewhere far away. The river would surely tell of the many spectators who lined the river bank from near the present-day Eisenhower Bridge to the river bend at Grand Avenue and, in silent witness, bid farewell. Throughout Indiana's Bicentennial year of 2016, Steve Jackson, Madison County Historian, will be authoring "If The River Could Talk." This series will feature people, places, and events that takes place in and around White River. 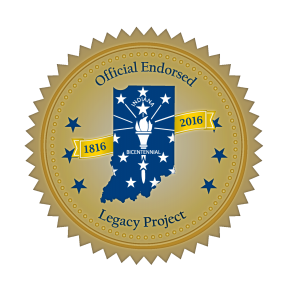 The series is an officially endorsed legacy project of the Indiana Bicentennial Commission.